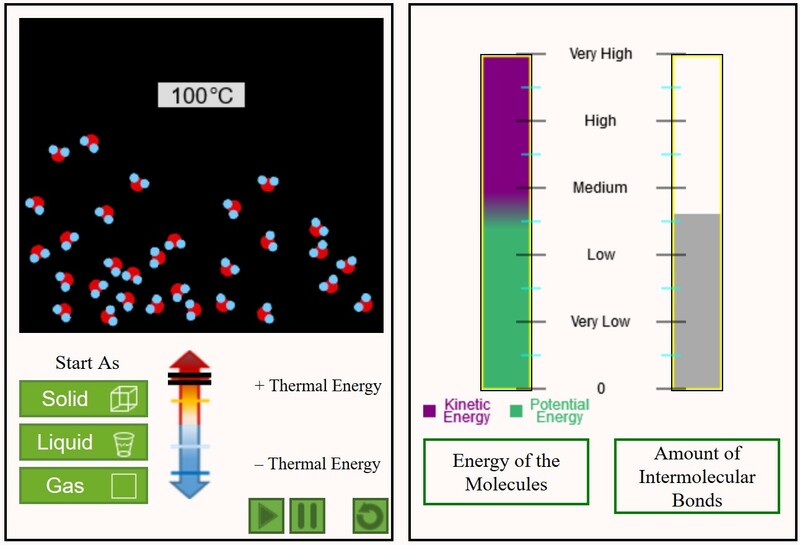 Kelly Ryoo develops visualizations — like this simulation depicting how energy affects the three states of matter — to help educators teach scientific concepts to eigth-grade English language learners. Kelly Ryoo found herself stumbling over these words in 2000. At the time, she was a graduate student at Stanford University studying education. While there, she focused on making online learning materials for pre-med students, and although she studied public health in her home country of South Korea, she found the medical terminology difficult to follow in English. “Even though I understood the concepts,” she says, “it was like a whole different language to me.” It was during this time that Ryoo began to think about what it must be like to be a child learning English as a second language. If she — someone who studied the language at a collegiate level — had trouble with scientific vocabulary, wouldn’t a young English language learner (ELL) have trouble, too? In the 2012-2013 school year alone, 4.4 million students in public schools in the United States were considered ELLs, according to the National Center for Education Statistics. Many of these students are integrated in mainstream classrooms, but aren’t familiar enough with English to completely understand complex words and concepts — so they often require extra support. “We need to support ELLs in science learning,” Ryoo, a professor in the UNC School of Education, stresses. For the past four years, Ryoo and her team have worked diligently to develop visualization technologies for science education — a resource she believes may be the key to bridging the language gap. These interactive learning environments provide dynamic representations of science concepts using simulations, models, and animations. “These technologies have been used extensively to teach science, and have proven effective, but there is very limited research on how they might specifically benefit ELLS,” she says. This research is so novel, in fact, that Ryoo recently received the National Science Foundation (NSF) Early Career Development Grant to implement, test, and expand it over the next five years. The NSF also gave Ryoo a Research for Experiences for Undergraduates supplement, which will support an undergraduate student from the computer science department to conduct a research project on how to collect and use interaction data from dynamic visualizations. Based on her current successes in seventh-grade classrooms, she has high hopes her visualizations will do wonders within an eighth-grade science curriculum. Approximately 90 percent of Cox’s students are ELLs. That’s why, in 2013, Ryoo approached the school with one of her visualization projects. “Topics like cellular respiration are so abstract,” Cox explains. “There aren’t a lot of manipulatives or hands-on lab experiences to teach those concepts.” She’d typically teach these topics through lectures and chapter assignments — now she can teach them through animations. Thanks to Ryoo’s NSF grant, she will continue her visualization research in eighth-grade classrooms this fall, with a focus on energy and matter concepts in physical and life science. The four web-based projects her team is developing will cover about 40 percent of the eighth grade curriculum, and will be geared towards low-income schools and ELL students. She will collaborate again with Cox and seven other teachers who are excited to bring this technology to her students this year. Kihyun Ryoo is an assistant professor of learning sciences in the UNC School of Education. Jamie Cox is a middle school biology teacher and sits on the board of directors for the Chatham Education Foundation. The National Science Foundation Early Career Development Grant is awarded to support junior faculty who exemplify the role of teacher-scholars through outstanding research, excellent education and the integration of education and research within the context of the mission of their organizations.